Can smoking during pregnancy cause SIDS? Smoking in pregnancy is bad news that is common knowledge. But did you know just how serious the consequences can be for your baby? Babies of mothers who smoked while they were pregnant have a much higher chance of Sudden Infant Death Syndrome. SIDS is an official diagnosis, but it is essentially no more than a fancy name for a baby who suddenly dies, with no known cause. Well, scientists think they finally know just why babies of smoking mothers have a higher chance of dying. 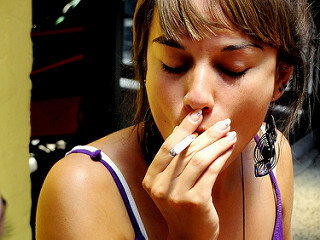 Nicotine, according a new study, can affect those parts of the developing brain that regulate breathing. If you smoke while pregnant, your baby is at a two to five times higher risk of SIDS, and smoking can also cause premature labor. A research team that analyzed the effects of nicotine in animals published their findings in the journal Pediatric Allergy, Immunology, and Pulmonology. According to the scientists from Cincinnati Children's Hospital Medical Center in Ohio, smoking leads to long-term alterations in breathing patterns and negatively impacts respiratory arousal, and auto resuscitation. In plain English, babies whose mothers smoked while pregnant have a lower chance of waking up in response to breathing difficulties, and have a lesser ability to start breathing again if it stops. The editor of the journal that published the study commented: "These findings highlight the importance of public health policies to prevent the development of tobacco dependence in adolescent girls and the importance of treatment of maternal tobacco dependence prior to pregnancy. Perhaps when young women are freed from the chains of tobacco addiction we can then truly say that 'you have come a long way for your baby'." There you are, smoking ladies who are trying to conceive make sure that you kick that nasty tobacco addiction before you get pregnant for the sake of your baby! Smoking for an easier birth? Don't do it!